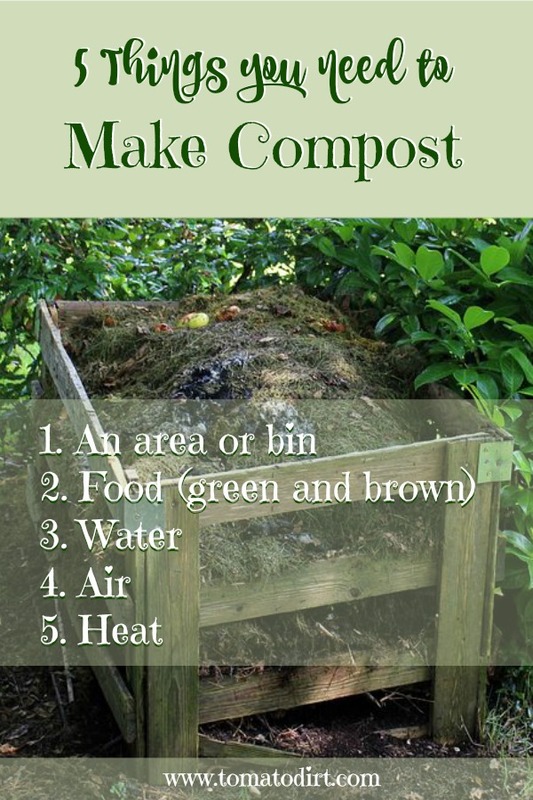 Composting is a process. The result is what gardeners have come to call “black gold.” Microorganisms feed on organic matter, breaking it down into humus, considered a stable soil conditioner. 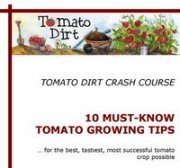 Make sure you include this important component in your garden soil as you grow tomatoes. You can make it or buy it. If you have limited space or live in an apartment, you can buy compost to add to your soil. If you have just a corner of space in your yard, you can start your own bin or pile to make it. The process for creating "black gold" is quite simple. At its most basic level, organic matter (like leaves and grass) gets wet and breaks down over a period of weeks or months – as it naturally happens on the forest floor, for instance. However, the process can become as involved as you like. Many gardeners take a more structured composting approach by using measured amounts of carbon-rich- and nitrogen-rich organic matter, proper aeration, proportional amounts of water to move along the decomposition process in a more systematic manner. Some gardeners can even get quite scientific about it. At Tomato Dirt, were interested in giving you the information you need to make compost for your tomatoes at whatever level of simplicity or complexity you prefer. We’ll start with the basics. Here’s the dirt. Why is "black gold" so good for tomatoes? In order to create compost, you need a designated area to set up the process. Your area can be as large or as small as you like. There are two basic kinds of piles: open bins and enclosed containers. Open bins can be constructed with wood, wire, or recycled plastic. By definition, as you construct an open bin, you create a means to open and close one or more sides, giving you access to add organic matter, turn the pile, and remove the mature humus to use in the garden once it is ready. Small piles can be turned with a pitchfork. Large piles can be assembled without any walls at all. The organic matter is turned and moved by tractors. Rain will moisten an open pile. By positioning it with access to a garden hose you provide a means to moisten the pile during a drought. Enclosed containers usually consist of one of two designs: upright box-like containers and rotating drums. These composters have an opening to add materials and water. A rotating drum is set up to allow the entire container to be turned, making it easier to mix the materials. Organic matter in an upright box must be manually turned. Where should you put your bin or pile? If possible, set your bin in the sun to encourage heat and air flow. You may want to consider placing it in a protected area so that it is not an eyesore, yet still in a place that provides easy access to your kitchen so you can routinely add scraps to the pile. Make sure the pile is accessible to your garden hose so you can periodically moisten it. What you need to make "black gold"
Successful composting requires four components: food, water, air, and heat. These raw materials and environmental factors combine to facilitate the process. To layer a bin or pile, begin with a 6 – 8 inch mixture of shredded green and brown materials. Broadcast a few handfuls of fertilizer or animal manure to help the compost pile heat up. Spread a thin layer of soil as a way of adding hungry microorganisms to jumpstart the breakdown process. Repeat layering a few times to build your pile. Set your bin or pile in an area with good drainage so that it can receive moisture but will avoid accumulating excess water. Moisten the pile with a garden hose when it gets dry in order to allow the decomposition process to proceed. If your pile is in a bin, remove the cover when rain is in the forecast. Aerobic microorganisms in your bin or pile need air to survive and to continue their work of breaking down organic matter. When the pile receives little oxygen, anaerobic microorganisms flourish, leading to fermentation. That’s why your bin or pile may occasionally produce a foul odor. It’s nature’s way of telling you to turn its contents and allow more air into the interior. Turning opens up air pockets in the pile. By “turning” the organic matter, you help microorganisms on the outside of the pile move into the middle, where there is more heat, which promotes breakdown. Turning also encourages overly-wet materials to dry out and maintain a more consistent level of moisture. You can turn a smaller open bin pile using a pitchfork. Larger stacks require a tractor. Materials in enclosed rotating containers simply can be flipped. Organic matter decomposes the quickest between 140ºF - 160ºF. Some breakdown will occur as long as the internal pile or bin temperature is above freezing. Materials in the pile are self-insulating. The middle of the pile will be the warmest.